This is St. Nicholas Church. It was founded in the middle of the 13th century and dedicated to St. Nicholas (no .... not THAT St. Nick), the patron saint of the merchants and seafarers. Originally, the church was a Catholic church. 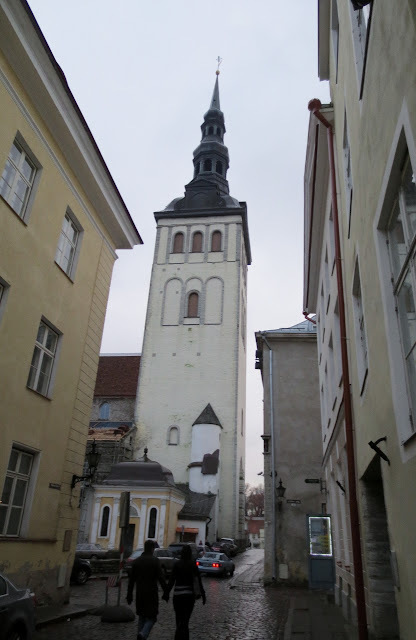 However, at the beginning of the 1520s, the first evangelical preachers reached Tallinn. The Reformation, started by Martin Luther, received the support of the local people and the reorganization of the ecclesiastical life was started. St. Nicholas' Church became a Lutheran congregation church. On the night of 9 March 1944, the Soviet air force bombed Tallinn. St. Nicholas' church caught fire and they lost a large part of its historical items (the pulpit, the benches, etc.). Reconstruction work began in 1953 and St. Nicholas' church became a branch of the Art Museum and concert hall in 1984. While I was standing in line to pay to get in (cost was €3,50) a lot of people bypassed the line on the left and went straight in. Those of us in the line were not happy, but nobody said anything. Once I paid my ticket, I had to give up my coat to a coat closet. The Estonians seem very big on this. Even when I was in the hospital earlier in the week, we were supposed to use the coat check. There were signs everywhere with a coat and a big RED line through it. It turned out that I was very lucky to have arrived about 10 minutes before an organ concert took place. This must have been what all of the local people were hurrying to. =) It was magical to be in the church and listen to the Estonian music. Afterwards I found out that choir or organ concerts are given here most Saturday and Sundays. The one I attended started at 16.00 on a Sunday. For those of you wondering what kind of organ, I read that the organ was built in 1981 by the Rieger-Kloss company and has 4 manuals, a pedal, 63 registers, and 4711 pipes. This is an amazing 350 year old decorative screen that was carved by Frans Hoppenstätt. It had been designed as a gate, that was originally located at the entrance to the memorial chapel to Bogislaus von Rosen. The two middle rows of panels served as doors opening into the chapel. Four virtues are on the panels of the lower row. The first three are the theological virtues: Charity with a child, Faith with a book and Hope with an anchor and a bird. At the end of the row is one of the antique virtues, Justice, with a sword and scales. The panels in the upper row feature four angels with the Instruments of Christ's Passion: the purple robe, the Holy Sponge on a reed, the whip and the pillar of martyrdom. On the top middle of the screen, there is a tablet with a text and the coats-of-arms of Rosen and his two wives. At one time there had been four angels on top of the screen, however only one has survived. Tombstone of Alexander von Essen, 1653. 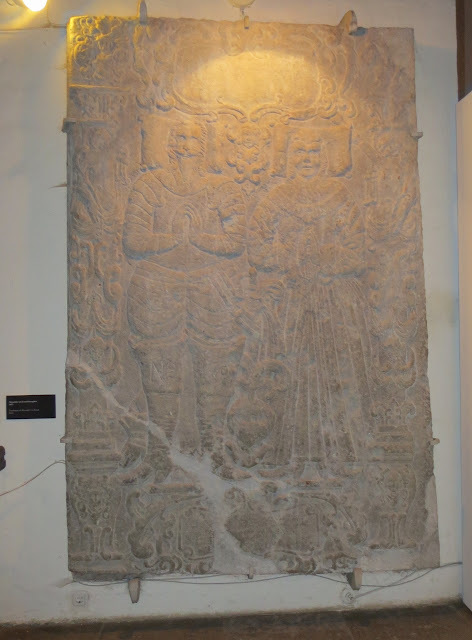 Tombstone of Adam and Anna Schrapfer, 1630. 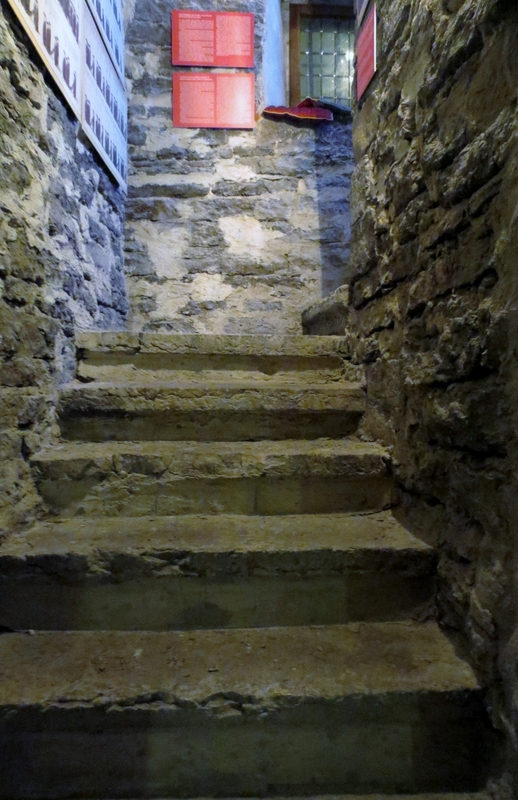 In this church there are several of these little staircases that don't really seem to go anywhere. 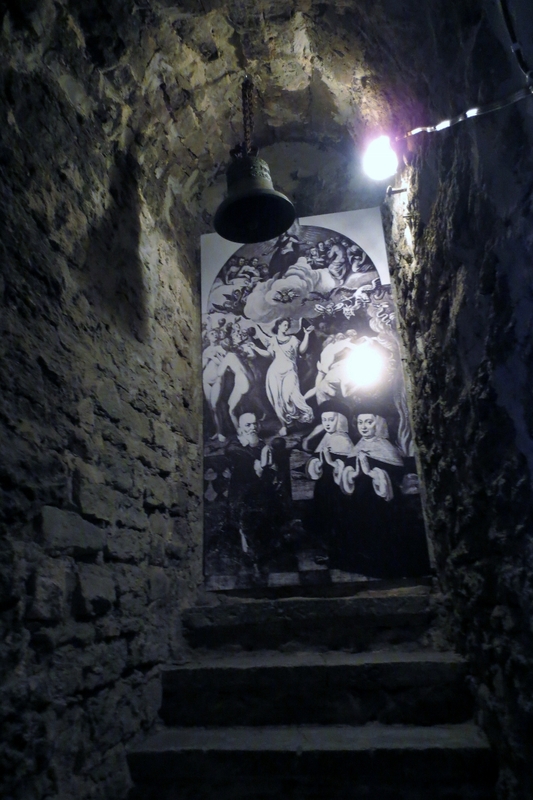 Here it leads to a bell. I could not find any information in English about the bell however. Here is a picture of Fabian von Fersen. 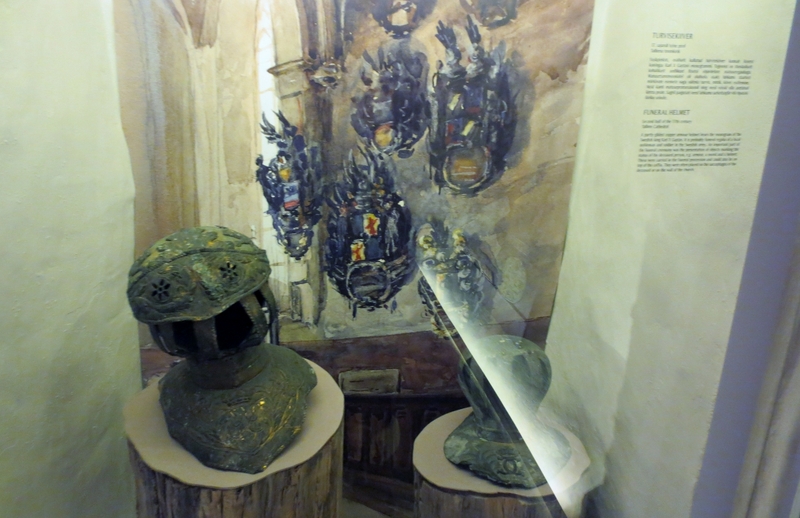 There is an exhibit with some of his items in the church. 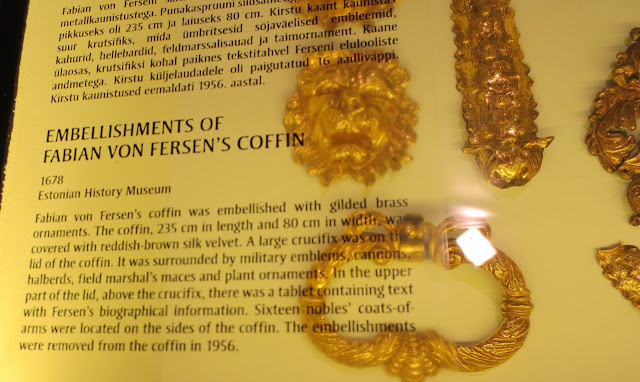 Here is a description about the embellishments of Fabian von Fersen's coffin. 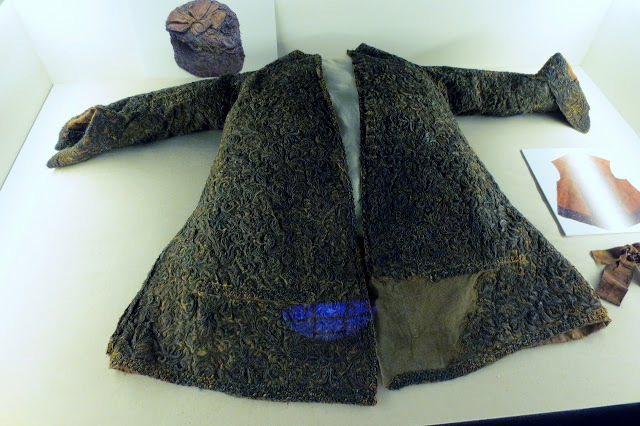 The description of this death coat is below the picture. Who is this Fabina von Fersen? 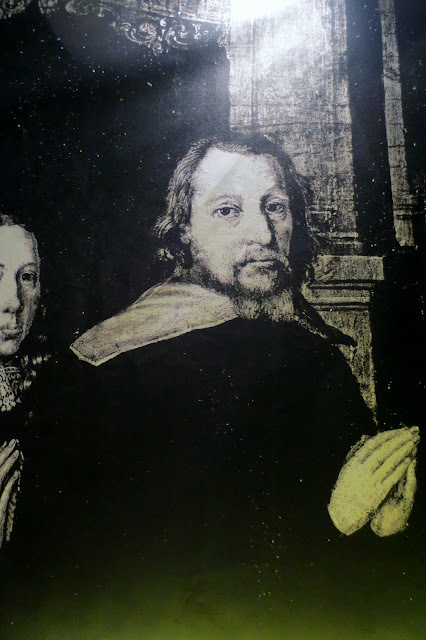 He was born in Tallinn in 1626 and he died in 1677. He died when he was 51. :( I just turned 50 this week and hopefully will have many more years. He was a high-ranking Swedish soldier and statesman. In 1663 he became the Governor General of Riga. In 1674 the king of Sweden gave him the title of baron. In 1675, during the Skåne War between Sweden and Denmark, he received the post of the Field Marshal General of Sweden. A year later he became the Governor General of Skåne, Halland and Bleking. He led the Swedish troops in June 1677 during the siege of Malmö. In a decisive battle on 26 June, the Danish troops were forced to retreat. Fersen, however, died of the wounds he received. In 1678 the Swedish king Karl XI named him posthumously, to the position of State Councillor. 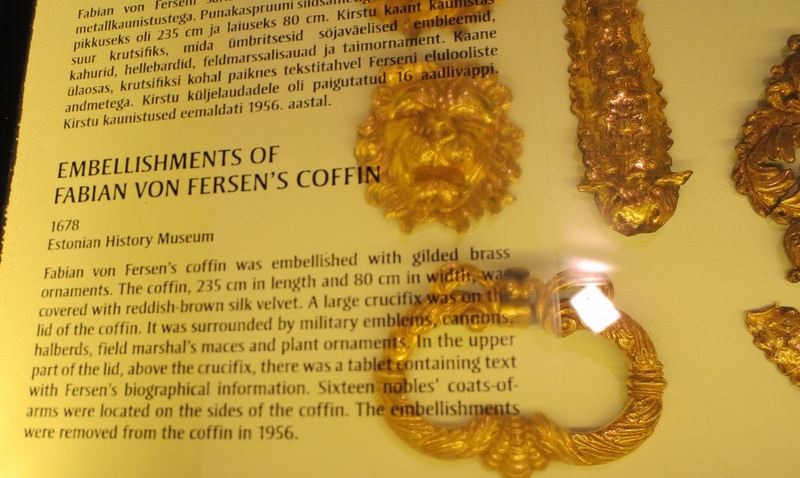 In his will, he asked to be buried in the Tallinn (Reval at that time) Cathedral. I'm thinking he should have also mentioned that the people should leave his clothes alone. Is it just me or does anyone else think it is wrong to open a coffin, take off the clothes of the man inside and then take all of the decorations off of his coffin? When I die, just leave me be please. 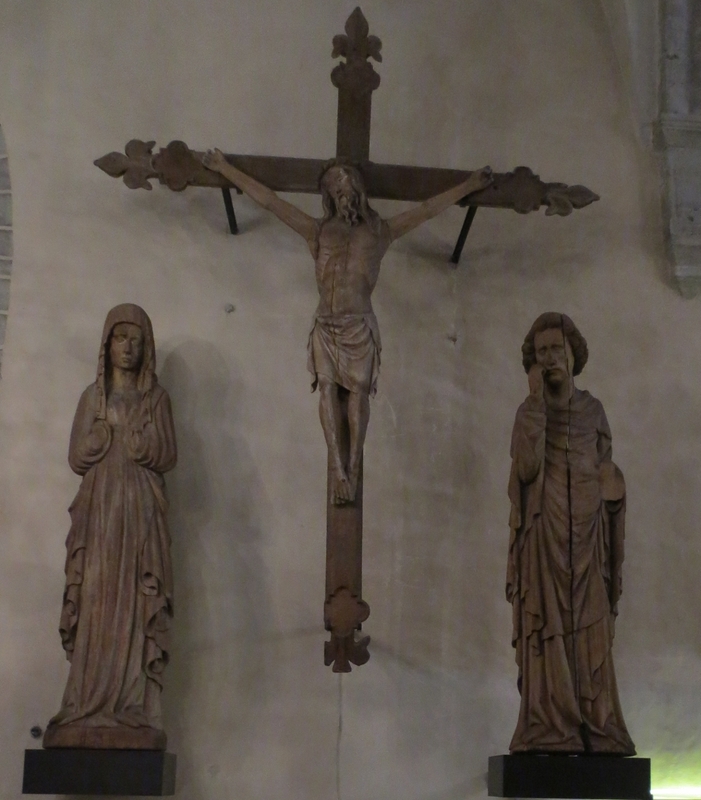 Here we have Christ on the cross along with a figure of a mourning Virgin Mary and St. John the Apostle. 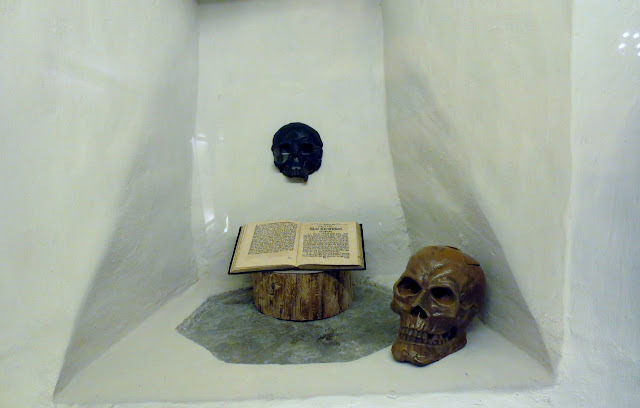 This group was formerly located in the Harju-Risti Church, which served as a chapel of the Cistercian Monastery in Padise during the Middle Ages. 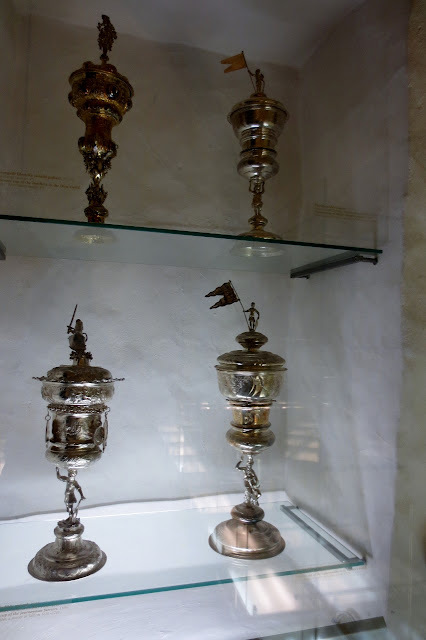 They are grouped together now but they were made at different times between 1410 - 1430 and they were not part of a group at the time they were made. I couldn't see it, so I will have to take the museum's word for it, that the back of the cross was originally painted. Most likely the symbols for the four evangelists were originally at the ends of the cross. In the middle of the back of the cross there was also a painted figure of Christ. And it turns out that All Souls' Day at the Tallinn's St. Nicholas' Church opened with an exhibition “Ars Moriendi - The Art of Dying,” which deals with post-mortem topics in the art of the Middle Ages and early modern period. Glad I figured that out. I was wondering what was going on. Turns out the exhibit will be there until June 2013. 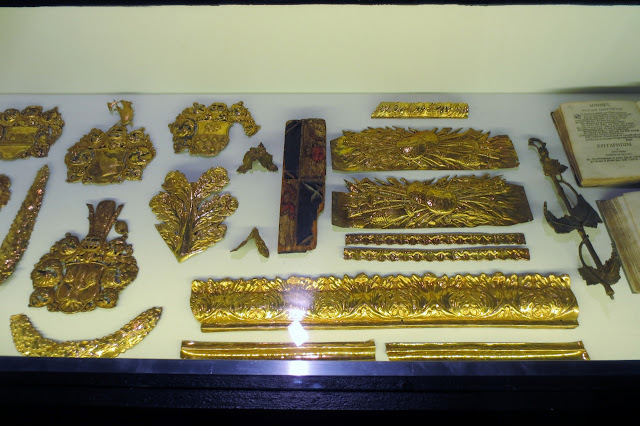 Curator Merike Kurisoo said that none of exhibition’s pieces date from after 1772, when church burials were forbidden by Catherine the Great, effectively putting an end to death- and memorial-related art in churches. 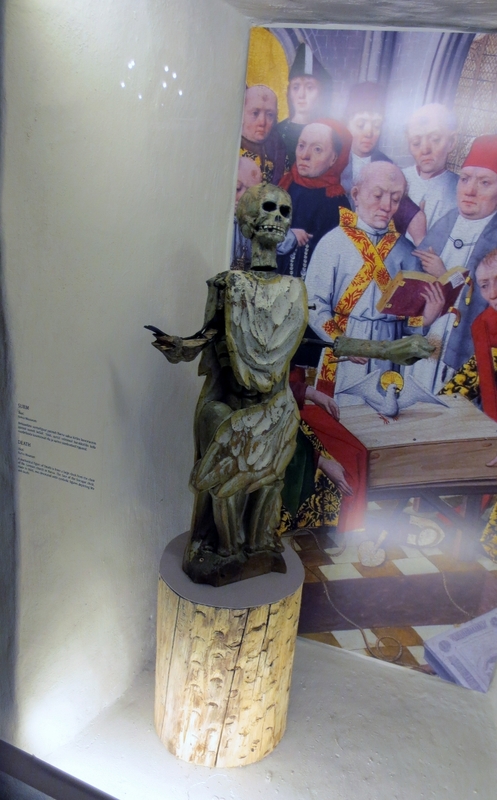 A mechanical figure of Death is from a large clock for the choir or the German church in Narva. The face of the baroque clock, made in 1666, was decorated with symbolic figures depicting life and death. 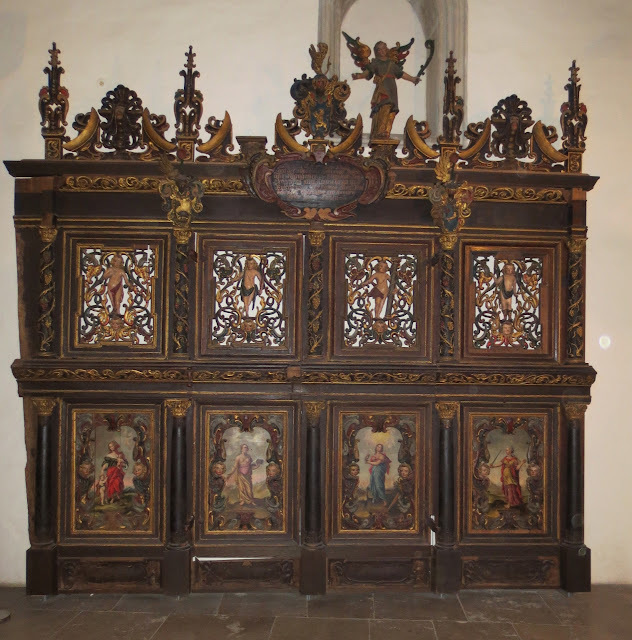 Below is the High Altar of St. Nicholas' Church. It was made between 1478-1481 by Herman Rode, master from Lübeck. On the far left and the far right are wings that fold in so that the high altar is closed. But on the back of this, is two more paintings so that when it is closed, you still have a work of art. 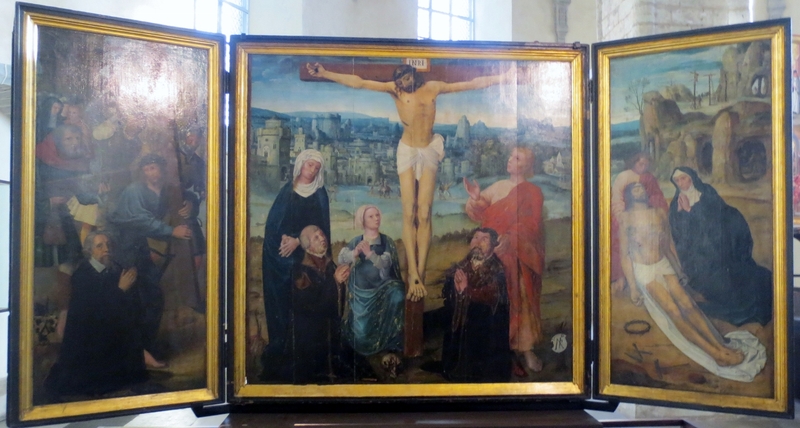 According to the museum, this is one of the most magnificent and best preserved late medieval northern German altarpieces in Europe. When it is fully opened, the width is over six meters (almost 20 feet) and the height is almost 3.5 meters (almost 11 1/2 feet). 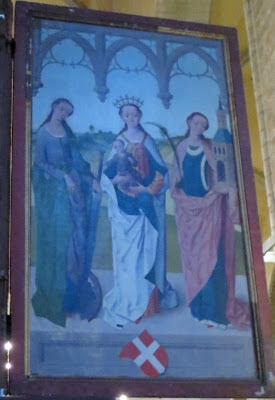 It is a typical double winged altarpiece. The position of the wings was determined by the days of the week and the holidays. There are more than 40 different saints and characters from the Bible shown here. At the time it was commissioned, it cost 1250 Rigan marks (I wonder what that would come to today?) 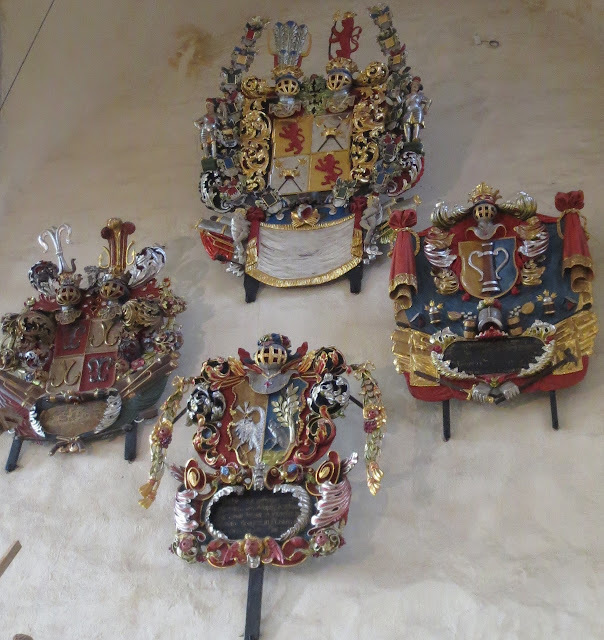 The congregation made donations but it is thought to have been primarily financed by the Great Guild of Tallinn and the Brotherhood of the Black Heads since the emblems of both associations have been depicted on the outer wings. 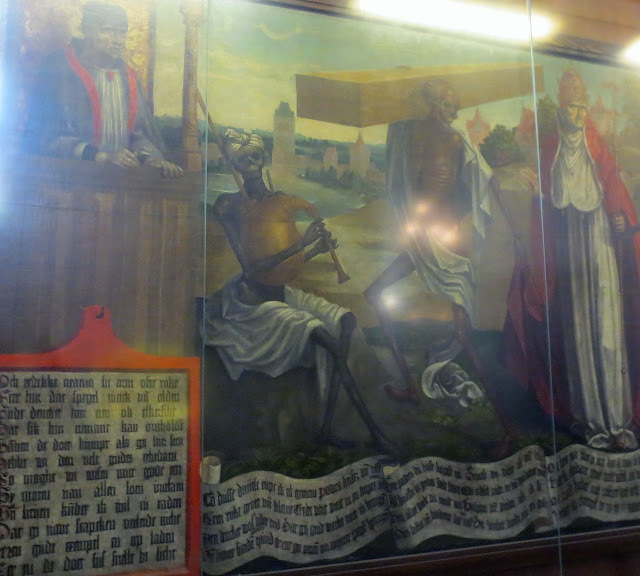 There is also a scene of saving a ship and the work shows the saints that were significant for these organizations. 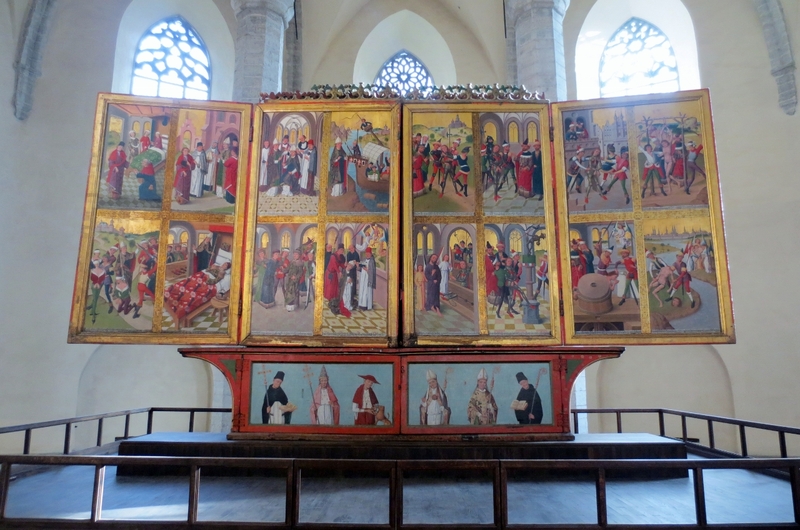 With the altar open, you can see scenes from the legends of St. Nicholas and St. Victor. You should read them from left to right, starting with the four pictures on the left in the top row and continuing with the four in the bottom row. Then you move to the top four pictures on the right and then continue with the four underneath them. The two left wings show scenes from the life of St. Nicholas. The top left corner shows the best known legend of St. Nicholas, which shows him giving dowry for three poor maidens. In the second picture, he is chosen as Bishop of Myra and in the third he is being ordained as a bishop. The last picture in the upper row shows St. Nicholas, the patron saint of seafarers and merchants, saving a shipwrecked vessel. In the first picture of the bottom row, St. Nicholas is rescuing three men; in the next one he appears in a dream to Emperor Constantine the Great, asking him to free the imprisoned merchants. In the next scene, merchants are being released by the emperor. 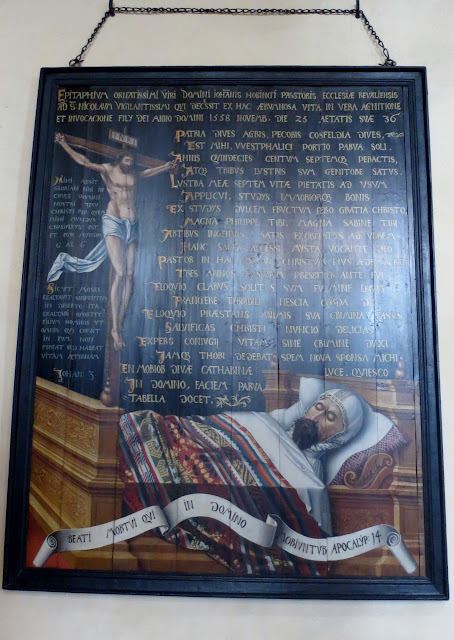 The last picture shows the death of St. Nicholas. The remaining eight pictures are dedicated to St. Victor who was martyred. The first four show the arrest of Victor, who had been preaching Christianity, Victor before the judge, the mocking of Victor in the streets of the town and follow with him being whipped. 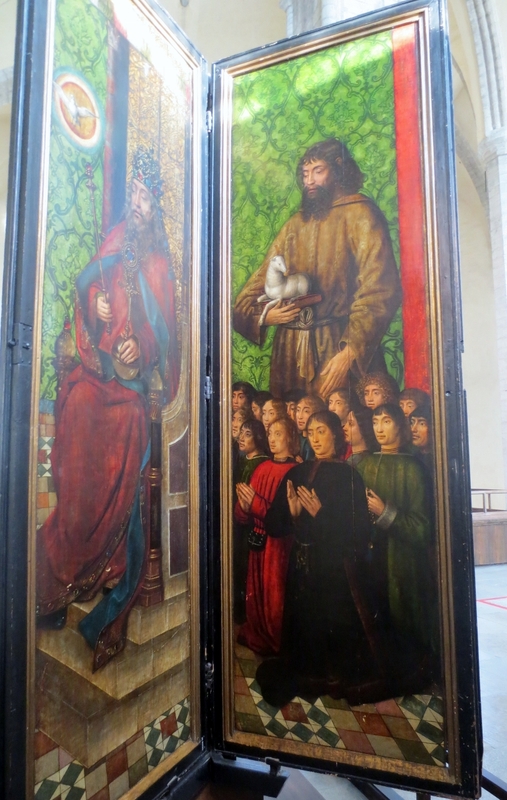 In the lower row of pictures, Christ appears to Victor when he is imprisoned and Victor refuses to show respect for a pagan idol. The story ends with Victor being executed and they throw his body into the river. The last scene shows the background of the city of Lübeck. It is the earliest preserved view of the city. If the altar was closed on the left side, you could see the three female saints (St, Catherine of Alexandria, the Virgin Mary with the Christ Child and St. Barbara) and on the right wing the three male saints (St. Victor, St. Nicholas and St. George). This is the presentation of Christ in the Temple. The Virgin Mary is handling the child to Simeon, who had been told by the Holy Spirit in a vision that he would not die until he had seen the Messiah. On the day of the presentation, Simeon was in the temple and gave his blessing to the Virgin Mary and her child. Behind Mary is a woman holding a small basket with two doves that were giving as a purification offering. In accordance with the Law of Moses in the Old Testament, the parents of a newborn child, would present the child in the temple and then sacrifice a pair of doves. In the background, there are two men, one of whom is Joseph. 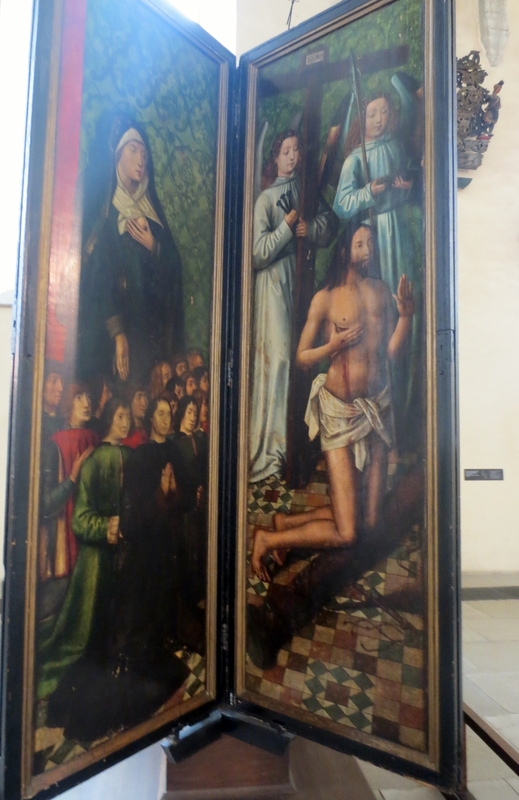 It is presumed that the painting was a part of an altarpiece consisting of 16 panels, that was in the castle of Sebenstein near Wiener Neustadt. 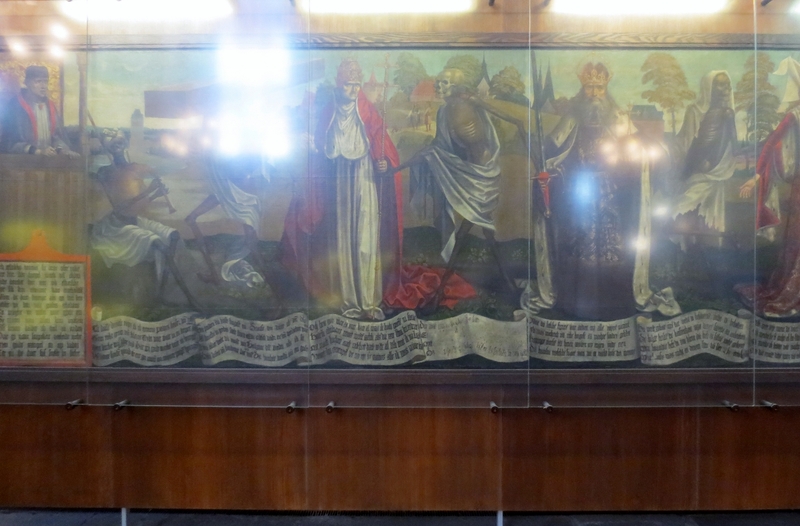 Fourteen of the panels have survived and belong to different art collections all over the world. The altarpiece has been attributed to a painter who was active in Vienna in the 1440's and 1450's. 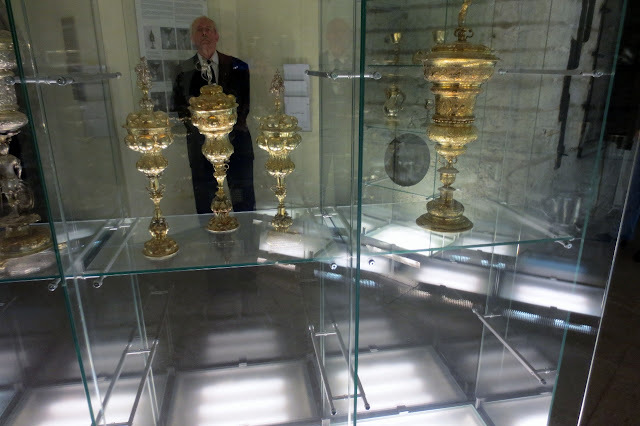 The Silver Chamber, opened in 2001, is home to stunning works by members of the town's craft guilds and the Brotherhood of the Black Heads. Below are the pendant shields. Traditionally, a craftsman who became a master would donate a silver pendant shield to the guild of his specialty. On it he had his name, the date when he was declared a master and the emblem of his craft. 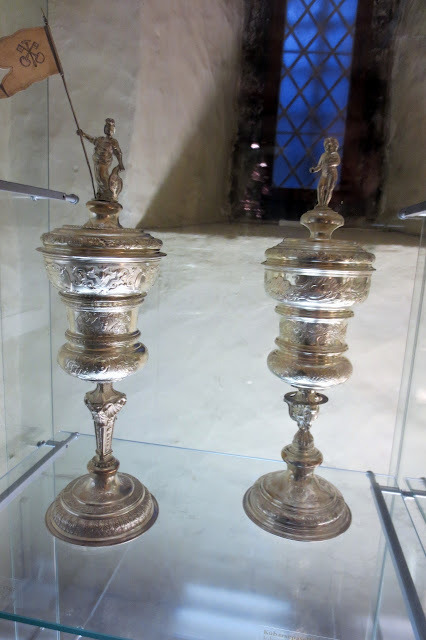 The collection is divided into three parts: church silver, the silver of the Brotherhood of the Black Heads and the silver of the guilds and crafts. 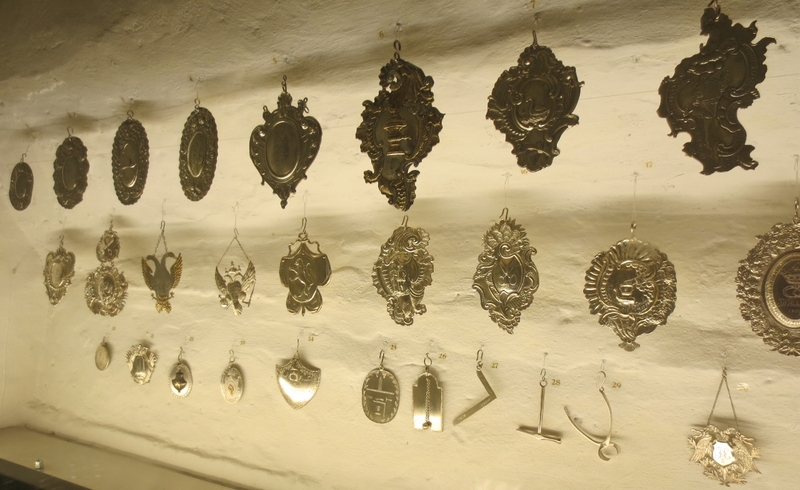 There are only a few European cities that have such an extensive amount of guild silver. This is the Holy Kinship Altarpiece. 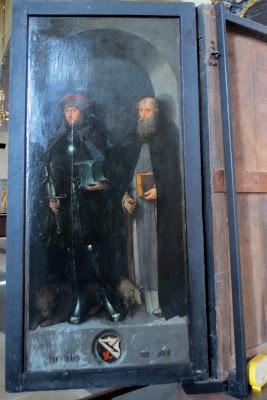 This is typical of late medieval southern carved altarpiece from the Netherlands but as there is a tiny hammer, which is the mark of the Brussels woodcarvers located under the two original figures, it is thought to have come from Brussels. It is thought to have been made around 1500. 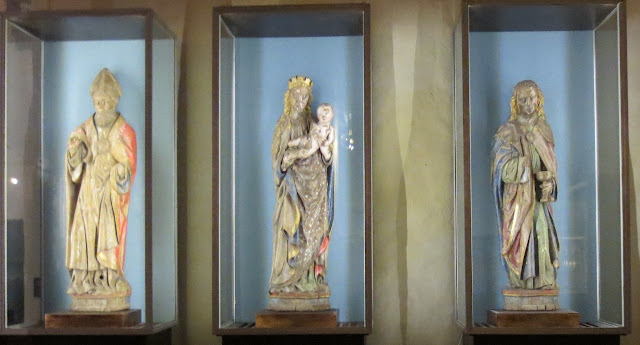 Only three of the original figures have survived: the Virgin Mary, her sister Mary Salome with her son James the greater, and their mother St. Anne. They were surrounded by the other members of the Holy Kinship, with their children. Only fragments of the painting on the wings have survived. They show four scenes from the lives of the grandmother of the Virgin Mary, Emerentia, and Mary's mother Anne. 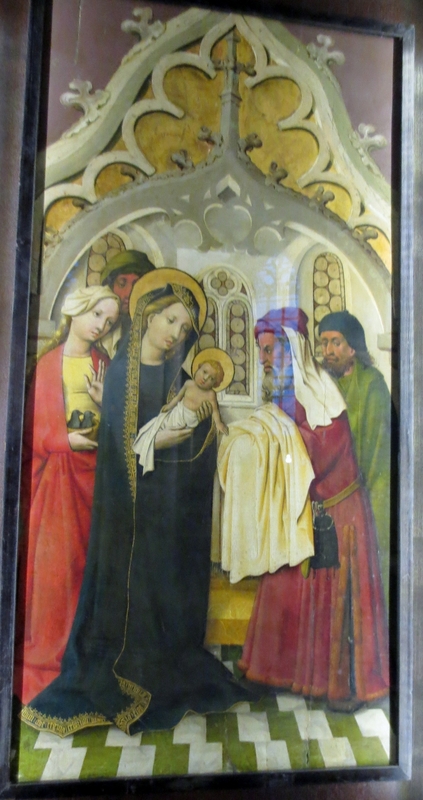 This is the St. Anne Altarpiece from the second half of the 15th century. 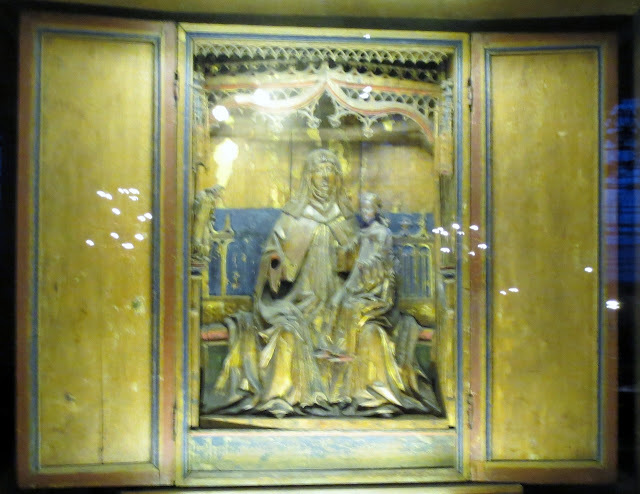 St. Anne is sitting on a throne and the crowned Virgin Mary is sitting on her left knee. The figure of the Christ Child did not survive. 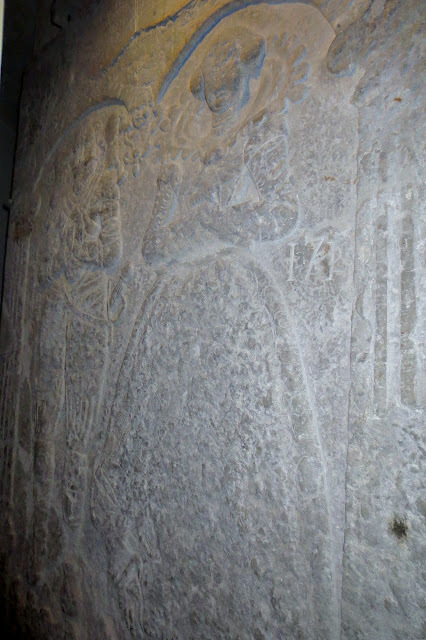 Only one of the angels standing on a small column on the edge has been preserved. The words "Jhesus Anna Maria" are partially legible on the lower edge of the altarpiece with a blue background. Here are three figures of saints - St. Nicholas, the Virgin Mary with Christ Child and St. John the Apostle from the Lääne-Nigula Altarpiece from the beginning of the 16th century. There were renovated at the end of the 16th and beginning of the 18th centuries. The altarpiece was destroyed during the Second World War. 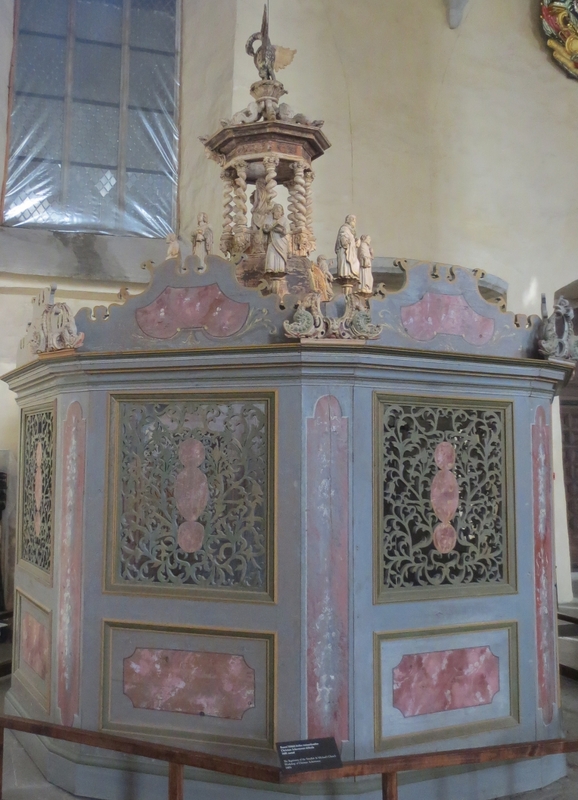 This octagonal baptistery is the only preserved Lutheran baptistery in Estonia. The chamber surrounds the baptismal font in the shape of a chalice resting on two pairs of angels. 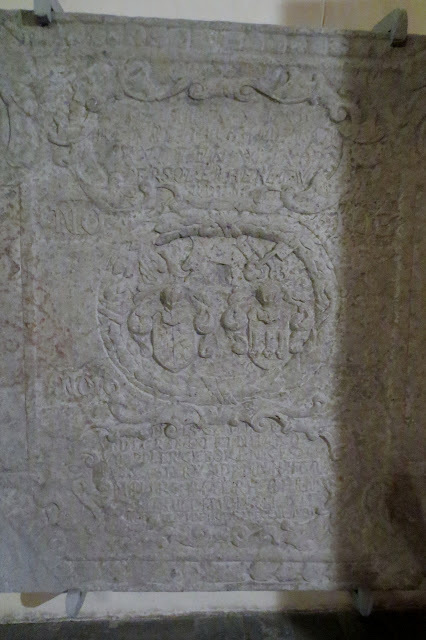 The font itself has not survived but its cover has and it is hanging over the baptistery. On the edge of the lid, there are figures of the Blessing Christ and seven apostles. The upper part shows St. John the Baptist baptizing Christ in the River Jordan. This actually has a special meaning for our family as my husband and I, along with my mother and niece, were actually baptized in the River Jordan too. On the top of the cover there is a figure of a pelican, referring to the blood sacrifice by Christ. Above the entrance to the baptistery, there is a tablet that says in German: "Let the little children come to me ..." Mark 10:14. This was made by Christian Ackermann in the 1680's. 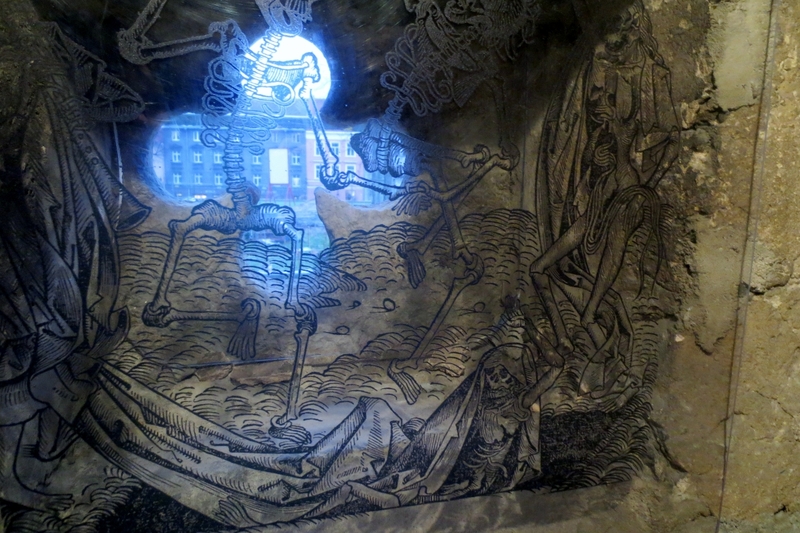 The painting Danse Macabre is the best-known and most valuable medieval artwork in Estonia. Only 7.5 meters (24 feet) containing thirteen figures has survived of the original 30 meters (98 feet). The painting was commissioned for St. Matthew's Chapel (also known as St. Anthony's Chapel since the 17th century) of St. Nicholas' Church at the end of the 15th century. It was painted by Bernt Notke, one of the most distinguished artists in northern Europe in the Late Middle Ages. Below the Dance of Mortals is introduced by a preacher from a pulpit, followed by figures of Death holding a bagpipe and carrying a coffin. The first dancer is the Pope, wearing a papal tiara. Followed by the King. 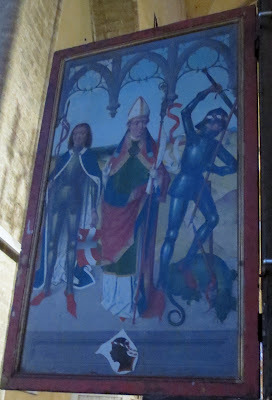 In the right hand corner of the painting, you can see the edge of the robe for the next character, the Bishop. 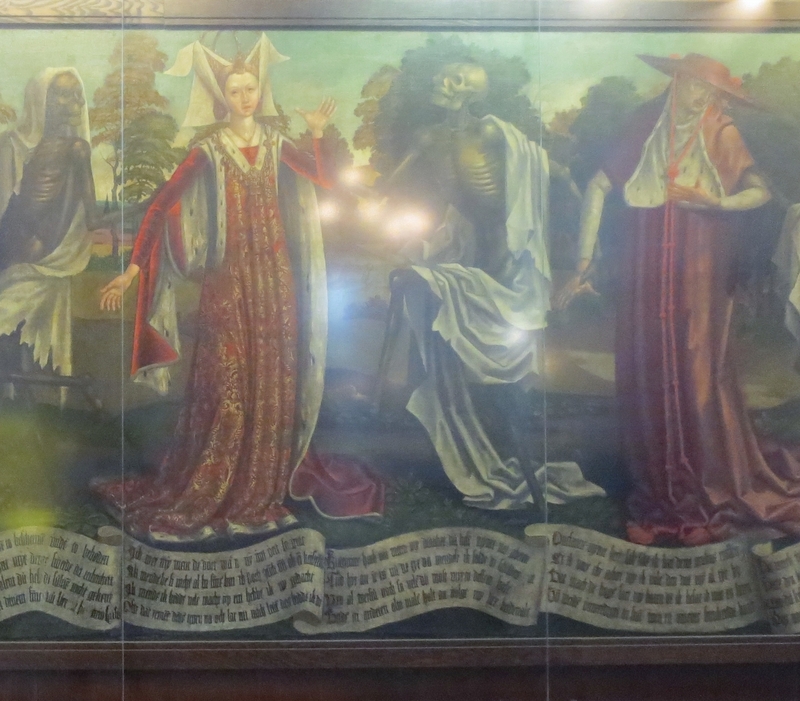 Under the figures there is a painted dialogue in verse between Death and the other characters written in the Low German language. 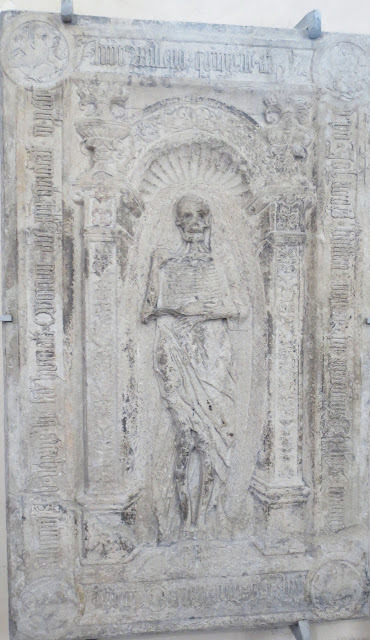 This is the tombstone of Johannes Ballivi, a doctor from France who arrived in Tallinn in 1519. He became the town physician but in 1520 he and his entire family died of the plague. In the middle of the tombstone is a skeleton representing death. On the outside edges, you can see vases with bunches of grapes and seashells. They are to symbolize the resurrection as well as eternal life. The portal was to symbolize a gate to the hereafter and Paradise. The grapes refer to the sacrifice of Christ and the redemption, and the seashell motifs refers to resurrection and eternal life. On the edges of the tombstone there is a band of very small text in Latin, with the dates of death of he and the members of his family; in the corners the symbols of the four evangelists are shown inside four medallions. This retable was commissioned for the altar of the Virgin Mary, which belonged to the Brotherhood of the Black Heads. It reached Tallinn in 1493. I was not able to get behind it to see what the back wings have on them. In this open view, you can see the Virgin Mary with the Christ Child on a throne. St. George and St. Victor are standing next to her. 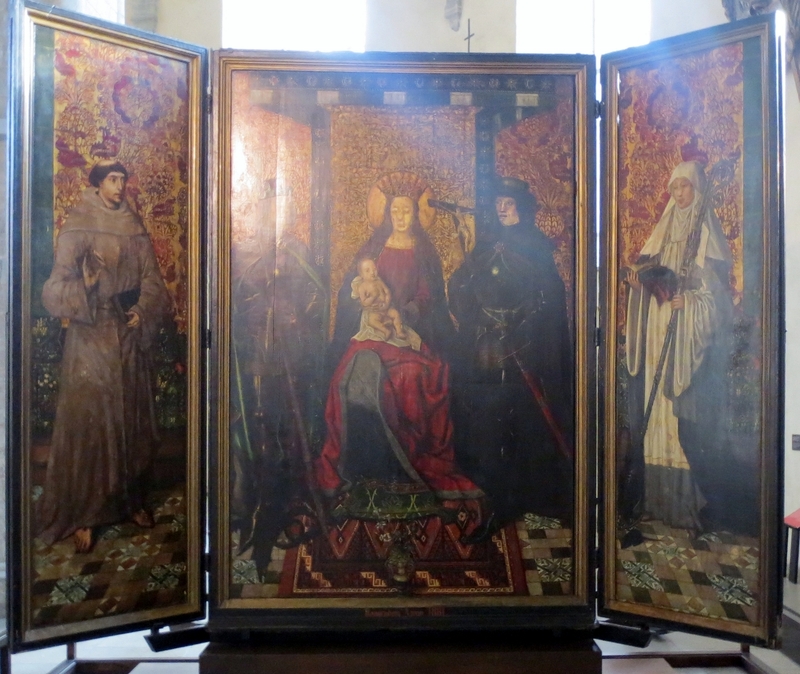 On the left wing, you can see St. Francis of Assisi and on the right wing, St. Gertrude of Nivelles. At Mary's feet there is a Turkish rug with a vase with a lily and an iris to symbolize her purity and royalty. 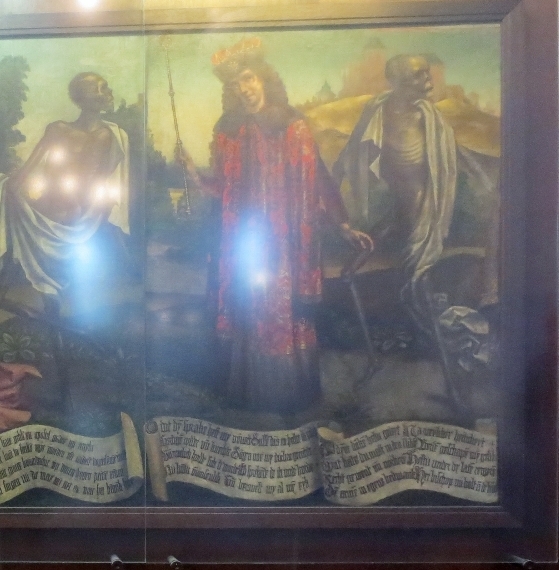 Here is another Altarpiece of the Virgin Mary of the Brotherhood of the Black Heads. This one was made before 1493. In the open view, you can see the following figures: the Virgin Mary with a bared breast with praying donors, Christ pointing at the wound in his chest with two angels holding the nails and crown of thorns, God the Father seated on a throne with an orb and scepter and John the Baptist with the donors. This represents the idea of gradual salvation. The Virgin Mary, pointing at her breast, which nurtured Jesus, prays for the salvation of the people. Christ, showing his wounds, appeals to God. Including St. John the Baptist adds the subject of the Last Judgement. Thirty men are kneeling at the feet of the Virgin Mary and St. John the Baptist. They are likely members of the Brotherhood of the Black Heads and the Great Guild. The men in the front of both groups could be the altar wardens. And these are the back of the wings. I have them placed so if the altar was closed you could imagine how it looked. The ribbon that is in the middle of each picture should show you where they would line up. The left wing shows the Archangel Gabriel, holding a lily branch and the right wing shows the Virgin Mary with an open book. They are not sure of the date, only that it was done before 1493. This one is the Passion Altarpiece. It was made around 1515. The main theme is the story of Christ's Passion. The middle panel shows Christ crucified. The Virgin Mary and John the Apostle are standing next to the cross. Mary Magdalene is kneeling at the foot of the cross. The 2 men praying were painted later, in the 16th century. 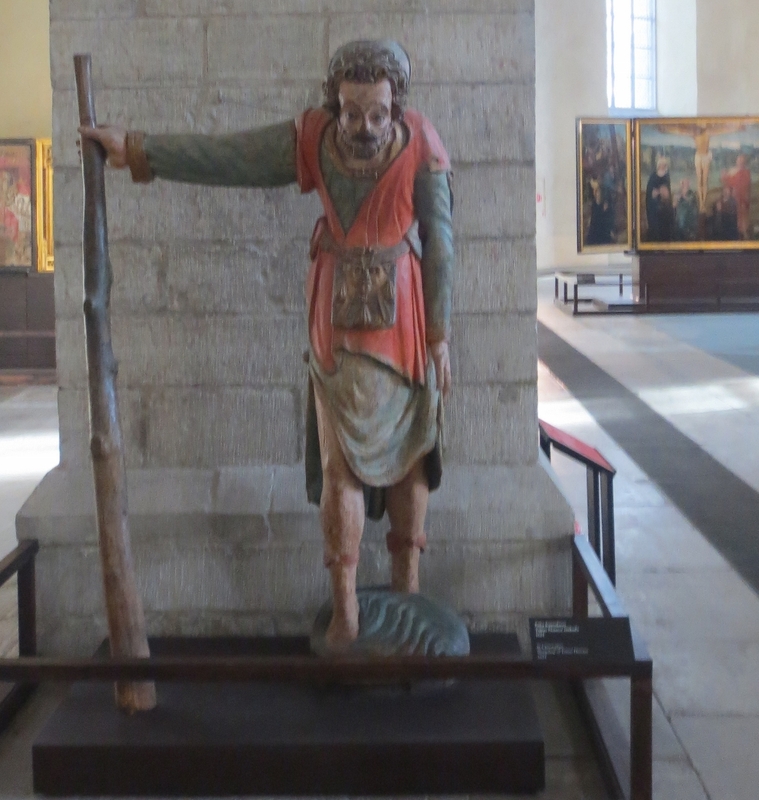 On the left wing, they show Christ carrying the cross and He is assisted by Simon of Cyrene.You can see Roman soldiers, the Virgin Mary and John the Apostle standing in the background. The figure kneeling in front was painted during the 17th century. On the right wing, next to the body of Christ you can see the Virgin Mary and John the Apostle in mourning. Near Christ you can see the crown of thorns and the nails of the cross. In the background, you can see Golgotha Hill with the three crosses visible. 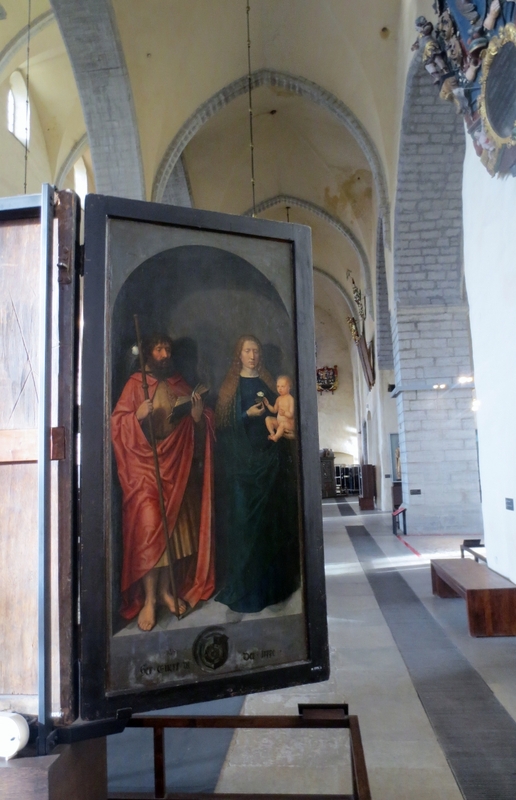 And if it was closed, on the left you would see the Apostle James with the Virgin Mary and the Christ Child. The right wing shows St. Adrian and St. Anthony the Great. These figures were added later, in about 1520. Originally they showed four Franciscan saints: St. Francis of Assisi, St. Anthony of Padua, St. Louis of Toulouse and St. Bernardino of Siena. These reliefs are from the beginning of the 16th century. On the far left, we have St. Dorothy. She is holding a small basket of flowers. According to legend, Dorothy was a beautiful and pious virgin who refused to marry a pagan judge as she considered herself a bride of Christ. The rejected bridegroom decided to have her executed but before her decapitation, Christ appeared to the people. He was bearing a basket with flowers, which he handed to the judge. After she died, the remorseful judge converted to Christianity. Next we have the Apostle Peter, the Virgin Mary with the Christ child and the Apostle Paul. 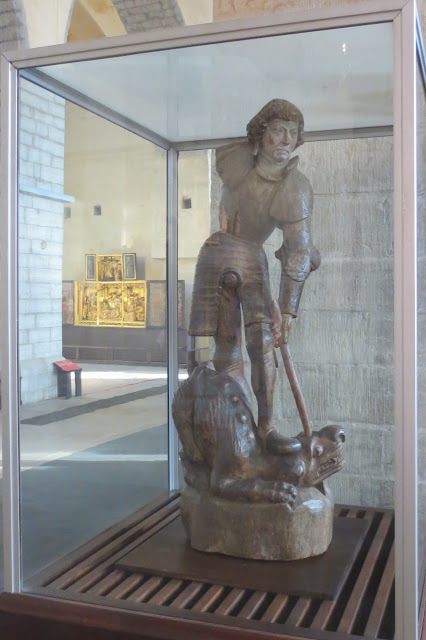 This statue shows the ever victorious St. George standing over a dragon that has been impaled by his spear. According to the legend, the courageous soldier saved the town of Silene from the tyranny of the dragon and the ever so grateful town people converted to Christianity. He was one of the most beloved saints during the Middle Ages and was the patron saint of knights, peasants and cattle, as well as one of the patron saints of the Teutonic Order. There are quite a few coat-of-arms epitaphs, or burial plaques, set up in the churches to commemorate individuals. They were carried before the coffin in the funeral procession and were later hung on the walls of churches in the vicinity of the tombs. And last, but not least, this 4 meter (more than 13 feet) high brass candelabrum is one of the largest medieval candelabras in Europe. 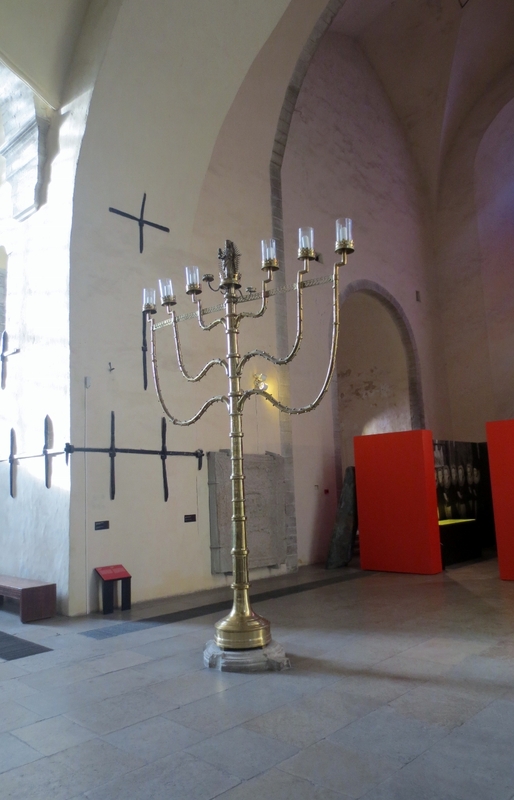 It was donated to St. Nicholas' Church in 1519 by the wealthy Tallinn merchant Hans Bouwer.